Last week, a [study] was published that changed the fundamental relationships among dinosaurs. Traditionally, and for the last 130 years, dinosaurs have been split into two main groups: saurischians (‘lizard hipped dinosaurs’) and ornithischians (‘bird hipped dinosaurs’). The saurischians include the giant, long-necked sauropods, the meat-eating theropods, and eventually modern birds. The ornithischians include the horned dinosaurs, the armored dinosaurs (like Triceratops and Ankylosaurus), and the duck-billed dinosaurs. The traditional view of dinosaur relationships. 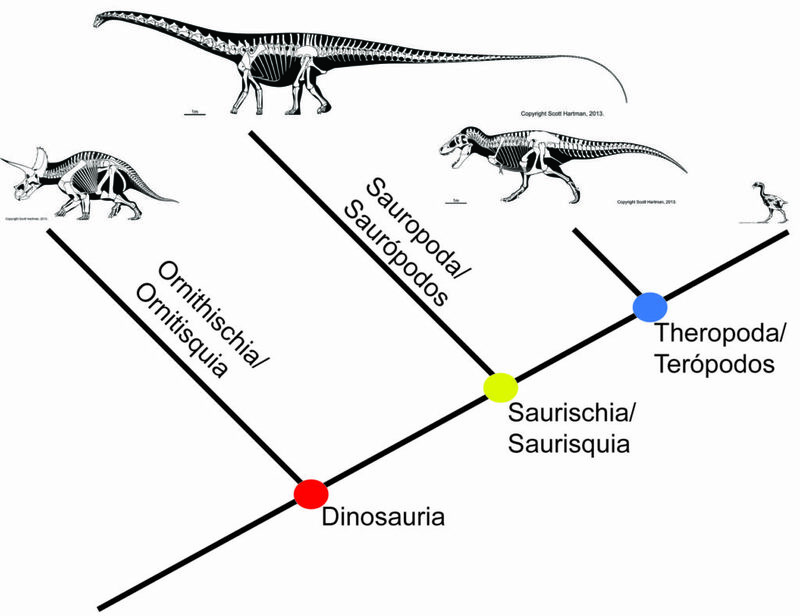 This main distinction occurs because of differences in the hips of these dinosaurs, hence the names. The hips are made of three bones: the ilium, the ischium, and the pubis. The ilium attaches the other two bones to the spine. The ischium forms the back of the hips. The pubis forms the front. In saurischians, the pubis points forward, very similar to the hips of modern lizards. In ornithischians, the pubis points backwards, very similar to the bones of modern birds. Now we know that birds are actually saurischian dinosaurs, but we didn’t know that when these groups were named. 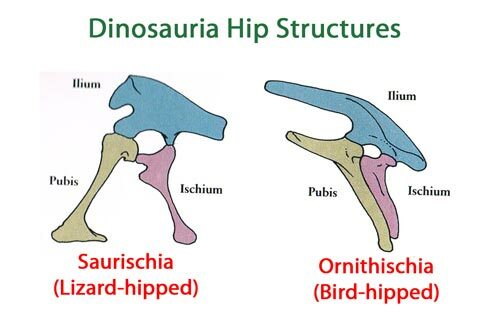 The differences in dinosaur hips. The dinosaur’s head would be to the left in these images. The ilium is in blue, the ischium is in red, and the pubis is in yellow. In saurischian dinosaurs, the pubis points forward. In ornithischian dinosaurs, the pubis points backwards. Source of image unknown. The new study focused on the earliest dinosaurs. Here are the specifics: they examined 74 species and 457 characteristics of their bones and ran an analysis in a computer program called TNT (Tree analysis using New Technology). This program looks for the simplest way the characteristics can fit on an evolutionary tree, while creating the fewest amount of changes (a principle called parsimony). 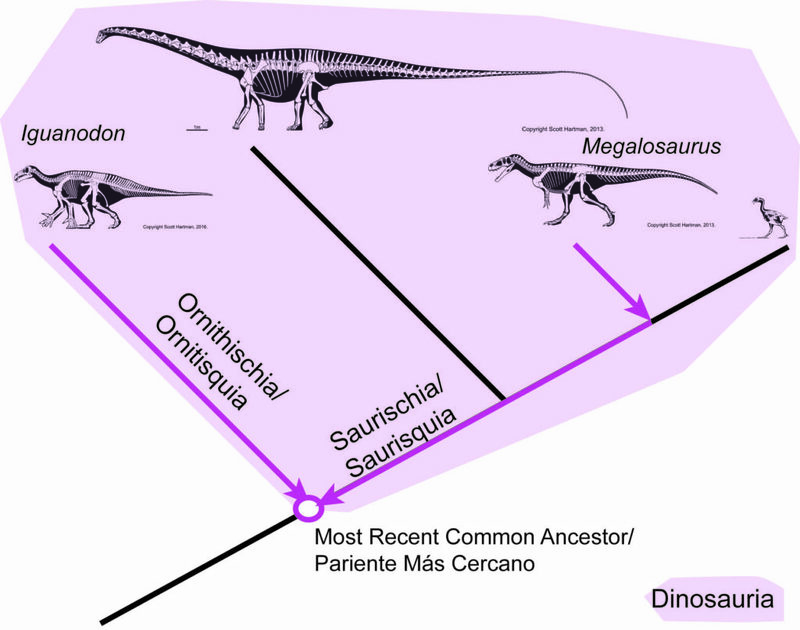 This analysis found that the ornithischian dinosaurs are more closely related to the theropod dinosaurs and that saurischian dinosaurs are most closely related to a group called Herrerasaurids. The new relationships among dinosaurs. So, saurischian dinosaurs were split into two groups. This leads to at least one major problem: the definition of Dinosauria. Dinosauria is defined as: Megalosaurus (the first theropod discovered), Iguanodon (the first ornithischian discovered), their most recent common ancestor, and all of its descendants. When dinosaurs were split into two main groups, using Megalosaurus and Iguanodon to anchor the definition made sense because it included all of the animals we recognize as dinosaurs within the definition. Now that theropods and ornithischians are closer relatives, this definition would exclude the sauropods and herrerasaurids from the definition. The traditional definition of Dinosauria. 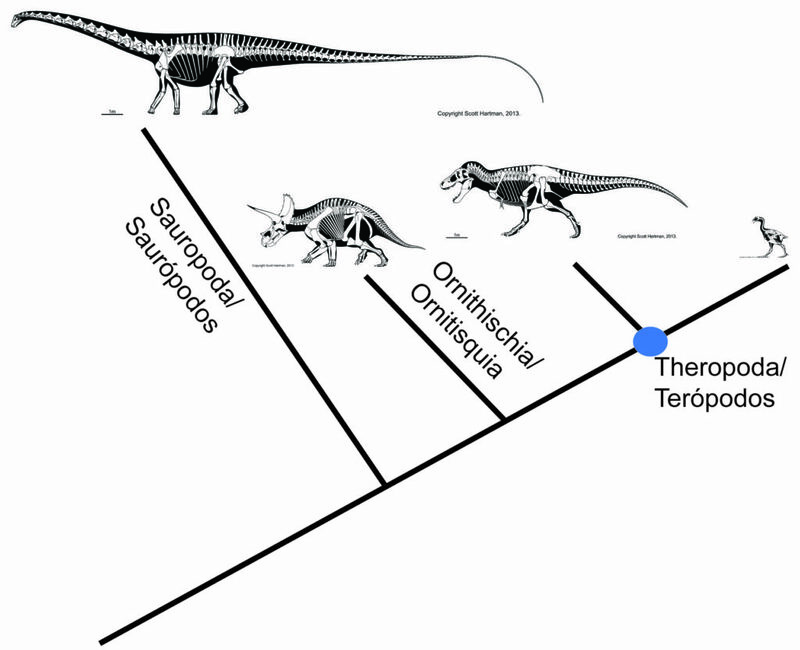 With the new relationships, sauropods would be outside of the dinosaur tree. 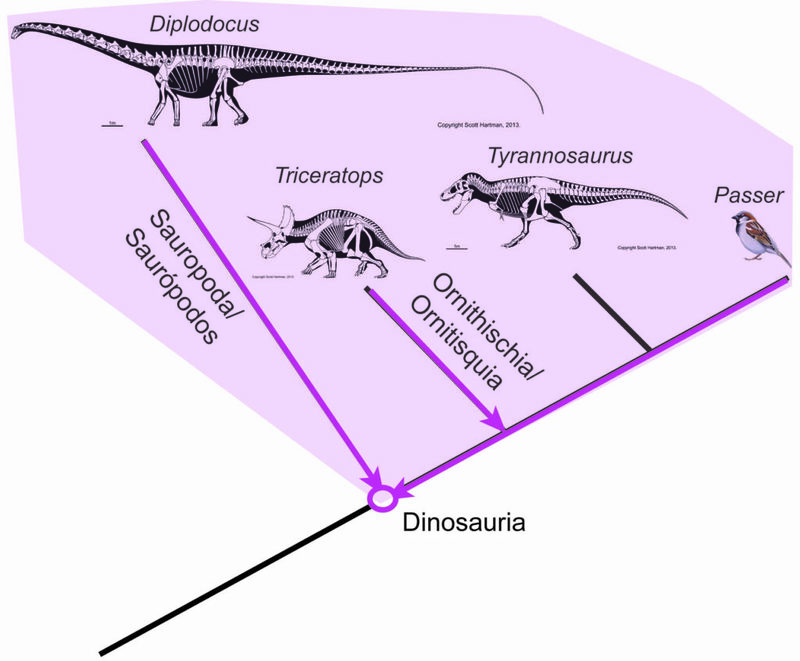 To fix that, the authors redefined Dinosauria as the least inclusive clade that includes Passer domesticus (the sparrow: a theropod), Triceratops horridus (an ornithischian), and Diploducus carnegii (a sauropod). That includes all the dinosaurs, and will keep including everyone even if the relationships in the tree change. The new definition of Dinosauria is anchored with a species from each group, so even if the relationships change, all the dinosaurs are still included in it. As interesting as this analysis is, there are issues with it. The main issue is that it’s the only analysis that gets this result. That’s not to say that it’s wrong! We just need to get the same answer with a lot more analyses before we start re-writing textbooks. Some of the technical aspects of the methods seem… off… as well, but I won’t get into those details until I can do more research. Basically, this is an interesting result and one that we should keep our eyes on, but we need more data to support it before we’re all on board. *All skeletal images from Scott Hartman. Passer image from Birds of the World Handbook.